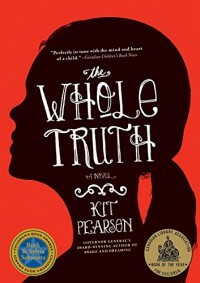 Kit Pearson's The Whole Truth is the story of two sisters, Maud and Polly, who are newly orphaned after the supposed drowning of their father and travel west by train from their home in Winnipeg, Manitoba to their new home on (fictional) Kingfisher Island, British Columbia to live with their estranged, maternal grandmother. The third person, limited omniscient narrator tells the story from younger Polly's perspective. 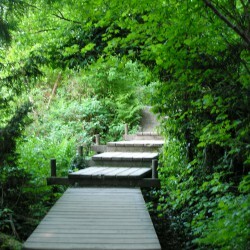 Consequently, the story begins with a ten-year old's response to grief: silence. She refuses to speak and instead observes the interactions between her fifteen year-old sister and their chaperone Mrs. Tuttle. Upon arriving in Vancouver, the girls are met by their grandmother and small extended family: Great-Aunt Jean and Great-Uncle Rand, the island's rector, and their university-aged son, Gregor. Together they travel by car ferry to tiny Kingfisher Island, located between Vancouver and Victoria where the girls will start their new life with the woman they now call Noni. But they need to adjust to more than just their location and family. No high school on the island means that the girls will be separated when Maud goes to boarding school in Victoria, and must to Polly's dismay, Maud can't wait to get there. Once the girls are separated, their stories progress quickly. Polly has to adjust to life alone with Noni and her new role as the new student at the island school. Maud also needs to adjust to her new school, but the narrative perspective restricts us to Polly's experience of things. She knows only what Maud tells her in her letters home, which creates even more distance between the sisters. But her distance from Maud also allows her to become independent and eventually foster new friendships with Biddy and Vivien. Even so, Polly longs to tell someone how she really feels about her lonely situation, but has sworn to Maud that she'll never talk about their father. So she resorts to writing secret letters to him instead. She hides these in her hope chest, each one full of the earnest hope of a young child to return to her life before. But as with most bildungsroman, that life of innocence will be lost. And whatever youthful hope Polly holds will disappear as the circumstances surrounding her father's disappearance come to light. Maud and Noni have been keeping a secret: Daddy stole money from his employer and drowned himself to evade capture. Polly vehemently believes in her adored father's innocence, against all opinion, and will not stand to have her father's memory tarnished. But tarnished it remains when her father suddenly appears on the island, much to Polly's delight. Her hope is shortlived, however, when her father refuses to refute the accusations put against him by Maud. Her father, it seems, really was a thief, made desperate by the economics of the time to attempt to support his daughter's any way he could. The indignity of Maud having to quit school in order to work and support the family was simply too much. When Daddy disappears from the island as quickly as he came, Polly is left to sort out her new conflicts with Maud alone. Despite all the unrest, Polly succeeds in growing up, being top of her class, and qualifying to move on to her sister's boarding school. Personally, I was drawn to the book by the cover. I was at once attracted and annoyed. The cameo is attractive, but the fact the text isn't level irked me. Now that I've read the book, it makes sense. The book is written from Polly's perspective so ultimately the truth of the story is filtered through her mind (hence the text in the silhouetted head), but it's not the linear, easily solved mystery she wants it to be. Something is slightly off kilter and she senses it throughout her dealings with Maud, Mrs. Tuttle, and Noni; they're all keeping secrets from her and "treating her like a baby" (p. 32). The book was longer than I expected (323 pages), but divided into three main sections that would make it easily teachable in a classroom as the transitions in Polly's life are clearly delineated. I was annoyed though at the quality of the publication; though its dimensions (5" x 7") suggests a trade paperback, it is in fact what the publisher HarperTrophyCanada calls a "digest paperback"--simply a glue-bound paperback which likely won't last long in a circulation library or a classroom. This will make it cheap for schools to acquire but expensive to maintain as a resource. Pearson does employ some narrative techniques that make the book both worthy of study in an English classroom, but also problematic for some readers. The narration frequently includes Polly's thoughts, which while set apart in italics, may be confusing for some less-skilled readers. In addition, as the story progresses, she also begins to write letters to her father. These too are in italics and are helpfully dated to assist readers in understanding the progression of the narrative, but they also provide the opportunity for large jumps in the narrative timeline, at one point, for instance, jumping from July to September 1933 in the space of one page (pp. 192). While certainly useful from a narrative construction point of view given the long timeline the story presents of Polly's life, understanding what happened during the gap does require stronger inference skills on the part of the reader. This type of multi-modal narrative can prove especially difficult for less-skilled readers; even my grade 10 students have significant difficulty with a book like Shade's Children where the chapters are sequential but the inter-chapter elements present different viewpoints and timelines. On the other hand, the inclusion of the letters does permit our limited narrator to present the thoughts of the other characters in ways other than dialogue and I enjoyed getting out of Polly's head, in part because I found her whining for Daddy so annoying. While Maud's letters from school are few, they do demonstrate how she is coping in her environment. The contrast between what Maud chooses to share with Polly and what Polly wants Maud to share with her helps to represent the growing gap between them. I could relate to that shift in sibling relationship as I went though similar changes with my brother (doesn't everyone? ), but we at least still lived together full time and could hash out our differences in person without the limitation that asynchronous writing can place on real communication (though we admittedly would at times IM each other from adjacent rooms to avoid actually talking). I did enjoy Polly's interactions with the other children on the island, however. In those Polly seems much more authentic than when stuck in her own thoughts. Making valentines and playing with her dogs were scenes that struck me as true. Not, of course, that real girls don't have thoughts and worries about her family like she does, but that's perhaps the problem: her worries are too real, too frequent, and not affected by the craft of the narrative as much as I'm used to. But perhaps that's my own bias against this type of children's literature, literature written FOR children. I'm a big fan of classic children's lit, but very little of it was ever written for children, and when it was the concept of childhood was much closer to that of the adult mind, so elements were rarely simplified or adjusted for young minds. And while I'm a huge fan of mysteries, I found I didn't really care what "the whole truth" was going to be, unless it would stop Polly's whining. I'm not familiar with any of Pearson's other work, so I don't really know if this type of voice is typical for her work either. I suppose if it's a hallmark of her characterisation then her fans would really appreciate this, but it didn't work for me. And the appearance of the pod of orcas "all in alignment, like a whale ballet" (p. 303) near the end of the book seems to signal the aligning of all the parts of Polly's story as she begins to finally launch in into womanhood (except she's not really, as she's too young, but it reads that way...perhaps a cultural difference between teens today and those of the early-mid 20th century?). Ultimately, I suppose I would agree with the conclusions in Amy Dawley's review of the novel that it would be a great choice for young readers who enjoy historic fiction (par.6), but would temper her conclusions that "the storyline, setting, character and plot development are all excellent" (par. 5) with 'for this age group'. Stronger, more mature readers will see weaknesses, some caused by the limitations of this point of view, others by the scope of the story. Dawley's discomfort with the subplots of Polly's vegetarianism and Maud's born-again-Christianity is well-founded, but, as Dawley asserts, these are attempts at more diverse character development which just don't seem to work as techniques. They seem to be attempting to highlight Polly's struggles with willpower and Maud's growing independence of thought apart from her family, but I think they'd be more effective highlighting the ultimate theme that 'people are complicated' (p. 322) and that they can be and do things which seem to counter their essential goodness and yet still be good...if only they were more artfully integrated into the narrative. Dawley, A. (2011). The Whole Truth. CM Magazine. Retrieved from http://umanitoba.ca/outreach/cm/vol18/no6/thewholetruth.html. Pearson, K. (2011). The Whole Truth. Toronto, Ontario: HarperTrophyCanada.